In this post-Pixar world, even little kids have come to expect a certain level of colour and in-your-face vavavoom with their entertainment choices. So I wasn’t all that surprised when my eldest son screwed his nose up at the latest edition to his bookshelf – Harry the Dirty Dog. “That looks boring, mum”, he wailed, after getting a glance at the old-style semi-monotonal drawings inside this children’s classic when I pulled it out one bedtime recently. He didn’t look at all convinced when I assured him he’d love it. So did he? Well, let’s just say ol’ Harry’s certainly looking a bit dog-eared now! For those that don’t remember or don’t know Gene Zion’s timeless tale, here’s the quick Babyology plot walk-through. 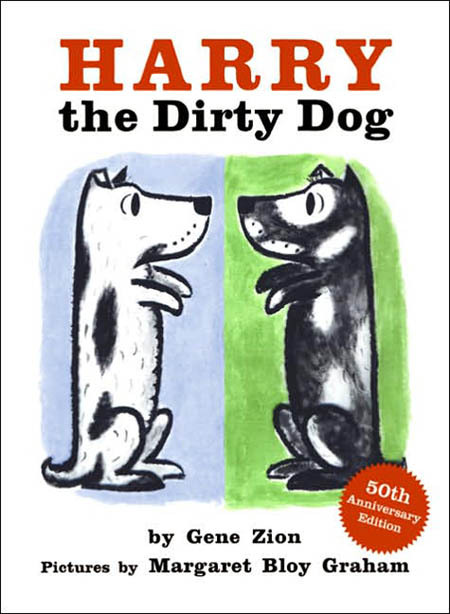 Harry the Dirty Dog is a white dog with black spots who runs away from home one day when his owners try to give him a bath. He spends a day on the town digging holes, rolling in coal and getting up to all sorts of other doggy hijinks. When he finally returns home, all that adventuring has turned Harry from a white dog with black spots into a black dog with white spots. His family don’t recognise him and shoo him away – until he digs up the scrubbing brush he had buried in the backyard and convinces them to give him a bath! While you don’t need a secret agenda to enjoy sharing Harry with your pre-schooler, it’s worth noting that this fabulous picture book might just encourage even the most reluctant young bathers to enjoy their pre-bedtime bubbles. 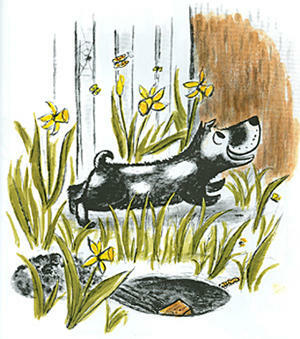 You can find Harry the Dirty Dog at most good bookshops around town. Or buy it at my favourite online booksellers, the Book Depository, for $9.53 (paperback) or $17.58 (hardback), with free delivery.